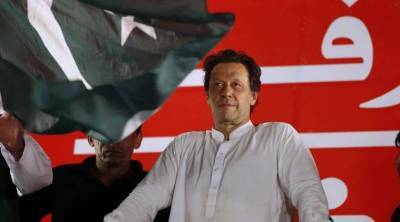 Islamabad (Staff Report): The Pakistan Tehreek-e-Insaf (PTI) on Monday officially announced the nomination of its chief Imran Khan as candidate for prime minister of Pakistan. A meeting of the PTI’s parliamentary party held in Islamabad and Imran Khan was unanimously nominated as candidate for prime minister. Shah Mehmood Qureshi, Arif Alvi, Asad Umar, Shafqat Mehmood, Imran Ismail, Fawad Chaudhry and others. Imran Khan thanked the party members after the nomination and expressed that his 22-year-long struggle had finally paid off. According to sources, the parliamentary committee has finalised Shah Mahmood Qureshi as their candidate for the post of National Assembly speaker. The sources added the committee is also expected to discuss nomination of leaders for key posts including Speaker, deputy speaker National Assembly, governors and chief ministers of the provinces. Imran Khan’s Pakistan Tehreek-e-Insaf (PTI) has emerged as the majority party in the National Assembly of Pakistan by securing 115 out of total 342 seats in the general elections on July 25. PTI has claimed that it bags the required number of seats to form the government in centre and Punjab.